Welcome back my fellow hackers! 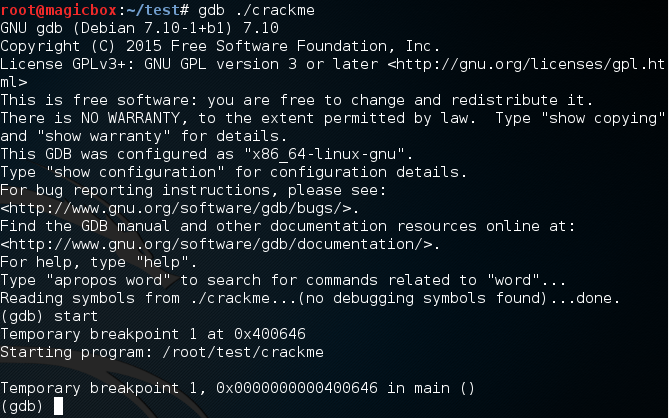 Recently, I’ve been delving into the incredibly interesting world of reverse engineering! I hope to write more about this topic some time in the future, but for now we’ll just start with something simple. I took a few days and made a small reverse engineering challenge. Today, we’re going to go through this challenge and solve it with all 3 intended solutions (if you can find more, leave them in the comments!). We’ll start with downloading and compiling the challenge, then we’ll start solving it. Our first solution will be a buffer overflow vulnerability intentionally coded into the challenge, then we’ll hunt down and execute a secret function to solve the challenge, and finally we’ll execute the program instruction to instruction until we can read the solution straight out of the computers memory! Now that we know what we’ll be doing, let’s get started! Now that we have our code compiled and working, we can start cracking this challenge! We’ll start with the buffer overflow vulnerability. Buffer overflows are very common vulnerabilities. A “buffer” is simply an area of memory designated for storing data to be processed or used in processing. If we can fill a buffer with more data than it can handle, we “overflow” it, and can then store data in areas of memory where we shouldn’t be able to. This can lead to code execution, which is how a lot of buffer overflow exploits work. But, in our case, we’ll be overflowing a buffer simply to change the value of the data being held in another. We can see here that we make a character array that holds 30 characters. So, if we input more than 30 characters, that will overflow this buffer, which will change the value of the “valid” integer. This integer is then evaluated later in the program and, since the overflow changed it to a non-zero number, it equates to true and logs in without a problem. Next up, we’ll be hunting for a hidden function in our program! We need to precede our string with a “0x” as this specifies it as a memory address. Now that we’ve wrapped up this solution, on to the next, reading the password out of memory! SIDE NOTE: For this solution to work you may want to re-compile the program with the -m32 flag to compile a 32-bit version of it. I’ve cut out the large chunk of text shown by GDB for the sake of organization. Now, we need to start the program with the start command. Once we do, we display current number of the EAX register. This is the register that our password will be in once we enter it. After we display the current contents of EAX, we use the ni command (next instruction) to move on to the next instruction in the program. We can see that a few instructions after we entered an incorrect password, the value of EAX changed. 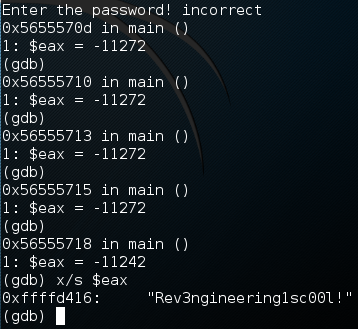 Now we can use x/s to read the contents of EAX as a string which, in this case, is the correct password to our program! This concludes our small reverse engineering article. I’d like write more about this in the future, but since I’m still learning myself, we’ll have to save it for another time. Just know that this idea is on the back-burner for now!